First test flight was a success. Pilot, operator, tech, all happy! Nice one. Still trying to wrap our heads around everything at Panavision. Mimicing what everything would be like in the helicopter, on the floor. We couldn't afford any wireless mishaps so we had to do a relatively complex micro wired network between the cameras and our computers. We used the Arri UMC-4 to control all 3 iris motors on 1 WCU-4 handset. All the cables prepped to get wrapped into one mesh cable wrap for protection and simplicity. We could not rely on house power anywhere, and the only piece of equipment that was not battery ready was our ethernet switch, so we had Louie at Panavision make us a Sony battery plate. Gotta have all of your "ducks (cards) in a row". Prelabeled and dummy-proof. We used the landing skids of the A-Star to run all of our cables into the cockpit and battery storage compartment. The view from the test flight, middle camera, all is well. Gert Uys is easily one of the best helicopter film pilots in the world, and he miraculously was able to stick an emergency landing without a hitch after a hydraulic failure...Scary. Not the most compact solution, but on a time and money budget, it works! Inovativ Scout 37 and Eurocopter AS350 playing very nicely together. Working with the inventor of the Libra stabilised head, Nick Phillips, I was tasked with technically running three Alexa Minis simultaneously in perfect genlock for my friends at M** (for NDA purposes ;). 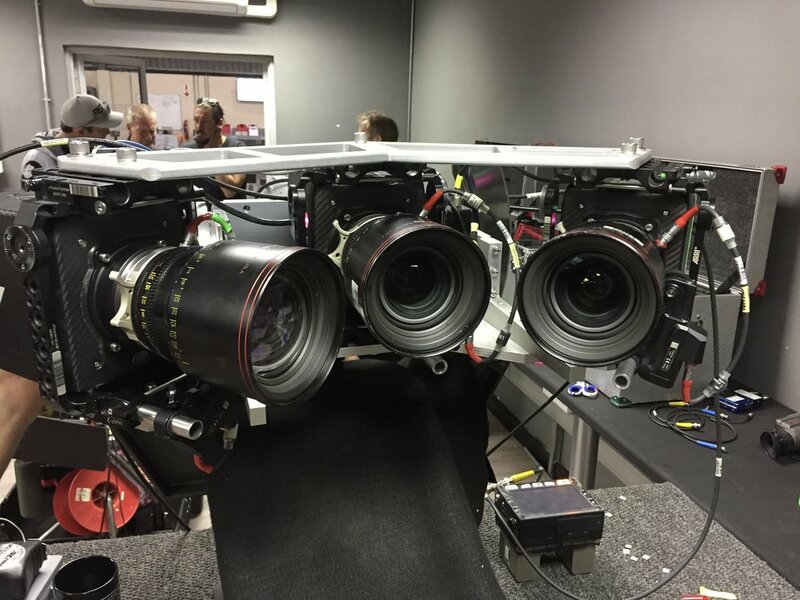 With Manoel Ferreira at the helm as the director of photography, we spent hours pre-rigging at Panavision in Cape Town, and then set out on the road to rig to one of Savannah Aerial's Eurocopter AS350. Genlocking the cameras together (syncing the black flashes between each frame to happen at the same instance) as the Alexa Mini out of the box comes with two SDI video outputs, but you can open the camera up and change one of the ports to a Genlock-in, which is what we did on all three cameras and then fed the cameras with a video-out sync from an Ambient LockIt box. Side note, you can achieve Genlock without doing the internal SDI swap (which means you lose the second SDI video out) by using a constant flicker-free timecode-in. This solution would work great using the new Tentacle timecode boxes and would introduce a relatively affordable solution to a time code sync (on the Minis, there is no internal crystal sync, so every time you power off the camera, you lose your timecode sync, which is an issue) as well as a video/genlock sync. Very cool! Having wired camera control over all cameras. We at first mounted this rig to a helicopter, and because of the strength of the various radios in the chopper, traditional wifi used to change camera settings, etc. is obsolete. I utilised the ethernet out on the cameras to run ethernet extension cables back to the cockpit and into a network switch. Then I attached my laptop to the same network switch (which we powered up with a Sony L-Series battery) and pulled up the web interface of all three cameras in a quad-view on my screen, so it was quick and easy to change an internal filter, white balance, or any other camera settings needed. Run all three cameras at the same time. We used one RS trigger in sequence and connected used RS splitter boxes to give the camera operator a single button to press at the remote controls. Make the rig as easy as possible to set up, as I was not always available to set up and operate the rig. We utilised colour coding and note taking as well as mesh cable looms to keep everything neat and tidy, as well as took hundreds of photos that were shared to make rigging times as short as possible. That is enough on that rig, but hopefully, it will be used on future jobs around the world as there are only two other alternatives for multiple camera remote solutions on the market at the moment, and they do not play nicely with the Minis and Panavision/cinema lenses. Great getting to know the technicalities of the Libra head better and I look forward to continuing to develop this system.